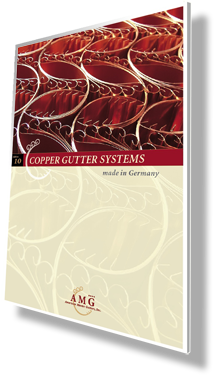 Thank you for visiting American Master Gutters, Inc. We are a leading provider of the finest copper gutter systems, accessories and ornaments available to wholesalers. Our elaborate gutters are used in residential and commercial applications, and all of our products, proudly carrying the MADE IN GERMANY seal of quality, distinguish themselves with outstanding functionability and excellence. American Master Gutters is a proud supplier of FREUND tools, also made in Germany and commonly used for sheet metal and roofing work. All of these great products are under one roof in Indianapolis, Indiana, where our office and warehouse are located. We look forward to offering you our services and would be happy to speak with you about our products, your inquiries or any questions. Your search for good quality stamped hanger has now come to an end! Premium quality Stamped Fascia Hangers are now available at American Master Gutter Inc.